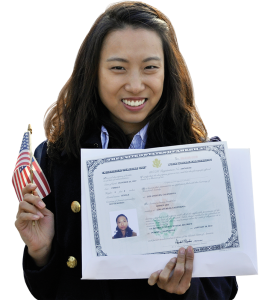 **NOTE: The following is an article by Sophia Lee, a recently naturalized American citizen, and is an inspiring story of her road to citizenship. Used by permission | © WORLD magazine, all rights reserved | www.worldmag.com. The morning I became a U.S. citizen, I stood between a well-groomed Vietnamese woman and a rotund Mexican man. In front of me, an Armenian with a ponytail raised his point-and-shoot camera. Behind me, a Korean young lady in heels texted rapidly into her iPhone. “Congratulations,” announced a U.S. Citizenship and Immigration Services (USCIS) officer after the Pledge of Allegiance. “You’ve made it this far.” We were among the 2,176 people of all skin colors, sizes, and ages who raised a right hand to swear loyalty and service to this country at a ceremony in Pomona, Calif., earlier this year. For us naturalized citizens, being an American isn’t a privilege. It’s a blessing. I say that because eligibility for citizenship follows a long list of qualifications beyond man’s will. As a single, non-military, non-refugee 25-year-old permanent resident, I had to apply for my own citizenship. (Eligibility for permanent residency—or a green card status—is a whole other long, costly process barricaded with tons more checkpoints). Becoming an American citizen requires lots of patience—and money. Five years after I received my green card (which cost more than $1,000), I filled out and slow-mailed an application form called Form N-400 to the USCIS, together with a $680 check for filing fees. In that 10-page N-400 form, I had to prove that (1) I lived consistently as a permanent resident in the United States for five years, (2) I lived in my current state for at least three months, and (3) that I was a person of good moral character (no felonies, no terrorist intentions, you get the idea). About four months later, the USCIS mailed me a thin letter stamped with a date and time for me to show up at the nearest USCIS office for fingerprints. The biometric appointment was pain-free—I was in and out within 20 minutes. Then I waited for two months while the FBI did a run-through of my fingerprints to make sure my background was as clean as I claimed. The second appointment for an interview took longer. I waited three hours in a crowded waiting room, staring bleary-eyed at a television that replayed—what seemed to my cranky mood at the time—American propaganda. I cracked open a Snickers bar for lunch, dozed off, and then awoke to a USCIS officer calling out my name. The officer tested my English skills—I had to write out a dictated sentence—and civics knowledge: “How many amendments does the Constitution have?” My verbal/written skills and moral character must have satisfied the officer, as I got a grant of approval from the USCIS within two weeks, including a schedule for my oath swearing. And just like that, I became a hyphenated American during a hotbed period of illegal immigration policy discussions. As I waved my flag in the air, I couldn’t help thinking about some of my friends who aren’t as blessed. For all the despairing talk about America’s draining economy and dismal future, it’s still today’s Rome. A U.S. citizenship guarantees precious rights and benefits denied to much of the world’s population. Whatever reasons immigrants—illegal or lawful—move to the United States, we all share a common desire for an opportunity at something better. As a person straddling three cultures, I used to pause when somebody asked me what I am. But now I can unhesitatingly answer that I’m an American—albeit an American with a British-Canto Singaporean accent and a 10-pound jar of kimchi in the fridge. Only in the U.S.A. God bless America! —Sophia Lee was a WORLD intern last summer and will join WORLD’s staff in September.